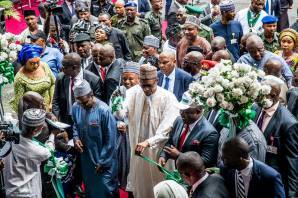 President Buhari inaugurates rice factory in Calabar – Royal Times of Nigeria. President Muhammadu Buhari says the Federal Government is committed to boosting Nigeria’s economy through Agricultural revolution and is already recording progress. 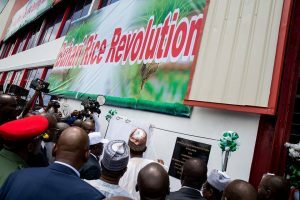 The President made this statement on Tuesday while commissioning the automated rice seed and seedling factory in Cross Rivers State capital, Calabar. According to the President, upon assuming the reins of leadership, his administration launched a zero oil economic roadmap as a way of making the country less dependent on oil while encouraging investment in other sectors of the economy, particularly agriculture.He applauded the Cross Rivers state Governor, Ben Ayade, over his contribution to the Federal Government’s Agricultural revolution. President Buharialso commended Governor Ayade for establishing various people-oriented projects. He said this factory speaks loudly about the giant strides Nigeria is making in agriculture as a country. 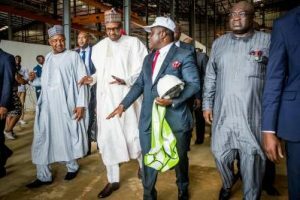 The automated seed and seedling factory is believed to be the first in Africa and the President is confident that the seedlings from the factory will improve rice production and sufficiency nationwide.